The reason: This official Chinese government notice announcing they are dropping the word 'education' from the "National Science and Technology Education Leading Group." this is being interpreted as increasing assistance to China's tech companies facing pressure from the trade war with the US. What assistance will be provided was not detailed in any English or Chinese filings we reviewed. 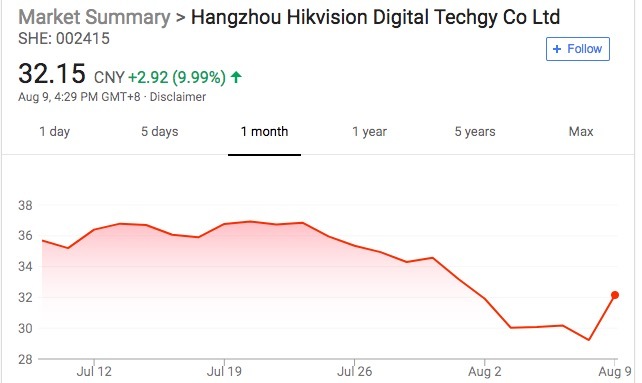 Dahua and Hikvision already tremendously benefit from Chinese government assistance and massive domestic projects. If the Chinese government does provide them more assistance, this will certainly help them inside of China. However, what they do outside of China to combat the US ban remains to be seen. ** ** *** ******* tech ** ~**%? ** ***** ******** ***** IT ***** **** **** than * *******, ***** an ***** ******** ***** telecoms ***** ****** ****** 4 ***. *****’* ****-***** start-up ***** ******** *** up *. * *******. ** ** *** **** enough ***** ******* **** companies ** ******** *** they ***** *** **** as **** ** ***** or *********. ****, ** stated *****, ***** ***** is ** ****** ****** information *** **** ******** about **** **** ***** will *** **, ** is **** ** ********. *************, ** *** **** time *** ** ** increasingly ******* ***** ***** companies ***** ********** ***********, the ******* ********** *** be ********* ***** *********** with ****.